Too many people, not enough data capacity. Reliance Jio’s data speed isn’t holding up under pressure. For months, the Mukesh Ambani-led upstart has been the chart-topper in terms of download speed, according to the Telecom Regulatory Authority of India (TRAI). In April, it logged an average of 19.12 megabits per second (Mbps). In comparison, Idea Cellular and Vodafone Network recorded between 13 and 14 Mbps, and India’s largest telecom operator, Bharti Airtel, came in last with 10.15 Mbps. However, new data from OpenSignal, a wireless-coverage mapping company that crowdsources carrier-speed data from its mobile app users, tells another story. It turns out that Jio’s download speed actually fares pretty poorly in day-to-day use. At just 3.9 Mbps, the London-based company found that Jio had a significantly lower average 4G download speed than all of its major competitors. Jio has the lowest download speed. To figure out the optimal network speed, OpenSignal created an “average peak speeds” metric by crowdsourcing data from 93,464 devices that have conducted multiple automated speed tests between December 2016 and February 2017. 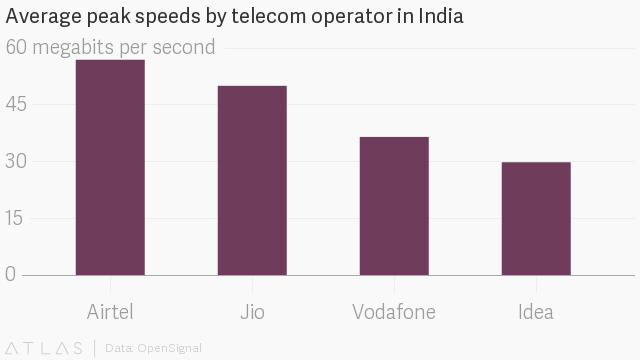 Using this data, OpenSignal then calculated the average of the top 5% of the fastest speeds measured for each of India’s telecom majors. While Jio recorded an average peak speed of 50 Mbps, second only to Airtel, this was 13 times faster than its 4G download speed, which has been stifled by congestion. The company has lured millions of customers by offering extremely low data prices ($0.7 per gigabyte). This month, Jio also launched an “effectively free” 4G feature phone, which comes with unlimited data priced at just Rs153 ($2.38) per month. These tactics have given over 125 million subscribers nearly unlimited access to mobile data, resulting in a bottleneck. “That kind of heavy usage is bound to tax any network, forcing users to vie against one another for bandwidth,” OpenSignal noted. One way to circumvent the problem is to add “more capacity—either through new spectrum or building more cell sites,” OpenSignal said. Another solution is to curb mobile data consumption by reeling back freebies and reworking price structures. The company expects the extraordinary data usage to eventually return “to more manageable levels,” by which time the big gap between its peak and average speeds should close.